Juncus glaucus, Blue rush, is perfect for winter interest as it holds it's color! 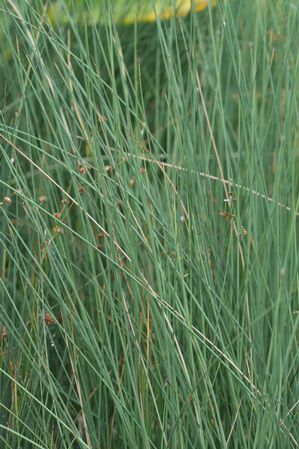 Upright blue stems resembling a blue fescue from afar live right on the pond edge in full sun and moist soil. This European native is hardy in zones 4-11. Flowers are inconspicuous. Reaching 1-2' in height and not spreading more than 2' makes this plant suitable for most pond sizes.